Come and visit the TAD stand at the SCIA 2014 Independence Expo! The Expo will showcase the latest technologies, personal care, specialised equipment and services, travel advice and recreation activities. TAD will be there to explain our custom designed equipment service where skilled volunteers design and build solutions such as special attachments to wheelchairs like trays, sun shades and iPad holders. The custom designed equipment service has produced wheelchair cricket bats, devices to help put on shoes and socks and more. Let us know your goals! 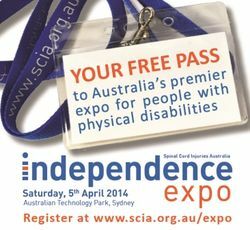 The SCIA Independence Expo is unlike any other disability expo currently held in Australia. It is specifically designed for people with a spinal cord injury and other similar physical disabilities, their family members, friends and carers. The aim is to inform, educate and improve everyday independence. Admission to the Independence Expo is FREE! Thank you to Spinal Cord Injuries Australia for generously supporting our exhibitor package. Visit the SCIA 2014 Independence Expo website to register.